blue is the color of time gone by..."
But one blue leads to another leads to a whole box. We grabbed handfuls, eating, picking, eating more. I swear I could taste the meadow and lake and the bee balm that drew swarms of humming birds in the lingering light. Greedy for more blues, for more summer, we filled the carton so that it took two to carry it to the check out stand. What is it about picking? Once I start I follow the branches back into my childhood, to those timeless hours in the berry patch. 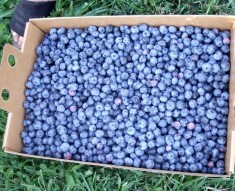 Blueberries and raspberries grew not far from my grandmother's home at the New Jersey shore. On those bright mornings, right after breakfast, before heading to the beach, I'd strike off to find them, beach pail in hand. This gave summer a sense of purpose and independence; I could bring back the making of jam, cookies, blueberry pie. Back in her kitchen, we'd sort out the best berries and chat about what to make. Maybe a conserve with lemon or should we steep in a cinnamon stick instead? Chair turned back to the stove, I'd stir, while she readied the jars, washing and drying them carefully. My grandmother never rushed any of this. She'd carefully scoop the steaming, fragrant preserves as though holding back the minutes ticking off on her big kitchen clock. I'd help, but that blue scented, spicy sauce would spatter and spill on the counter and of course on my shirt. "That will come out with bleach," she'd say, gently wiping it off. Slather this on toast, pound cake, and spoon it into yogurt. Brush it over chicken or pork just as it comes from the grill. Put the blueberries, lemon rind, lemon juice and sugar into a large pot set over high heat. Bring the mixture to a boil, stirring gently to dissolve the sugar. Continue boiling for 10 minutes until the juice has thickened. Watch, and stir gently, so the bottom of the pan doesn’t scorch. To test for readiness, put a teaspoon of the preserves on a cold plate, put the plate in the freezer for a few minutes, and if the preserves then seem firm to the touch, they are ready. The syrup should reach 221 degrees on an instant read thermometer. Ladle the preserves into the hot, sterilized jars, leaving ½ inch of headspace. Wipe the jar rims, center the lids on the jars, and screw on the bands until they are just finger tight. Process the jars for 10 minutes in enough water to cover the jars by 1 inch. Turn off the heat, remove the canner lid, and allow the jars to stand in the hot water for 5 minutes before removing them. Cool the jars for at least 12 hours before storing them in a cool dark place. Beth, I love these stories from your childhood. They remind me of one of my favorite children's books called "Blueberries for Sal," by Robert McCloskey. Do you know it? Your recipe also sounds delish—can't wait to try it!